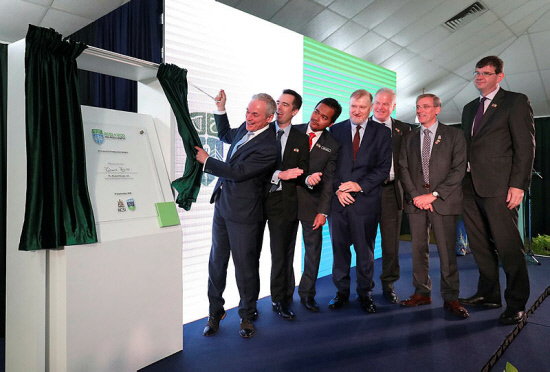 GEORGE TOWN: Ireland is keen to tap the research grants available in the European Union (EU) and share them with educational and research partners here in Malaysia, Irish Minister for Education and Skills Richard Bruton said today. It is the only predominantly English-speaking nation in EU after Britain opted out of the union, he added. Bruton was speaking after launching the Royal College of Surgeons in Ireland (RCSI) and University College Dublin (UCD) Malaysian medical campus in Jalan Sepoy here. RCSI and UCD are the oldest medical institutions in Ireland. Present at the launch were Education Ministry Deputy Director-General of Higher Education (Private Institutions of Higher Learning) Dr Mohd Nor Azman Hassan, RCSI and UCD Malaysian campus president Prof Stephen Doughty, UCD deputy president Prof Mark Rogers and RCSI president Kenneth Mealy. Earlier, Irish Ambassador to Malaysia Eamon Hickey spoke of Ireland wanting to expands its ties with Malaysia in many areas, from stem cell research to information technology and tapping the overall Industrial Revolution 4.0. Nor Azman said Malaysia was keen to collaborate with various countries in the field of higher education, especially in highly skilled areas such as medical and in pursuing joint-research efforts.